Moyness House is a gracious Victorian villa, dating from 1880, which was once the home of acclaimed Scottish writer, Neil M Gunn. It is situated in a quiet residential street, just a few minutes walk from Inverness city centre with its many excellent restaurants and shops, the beautiful River Ness walks, and Eden Court Theatre complex. The 6 en suite bedrooms combine contemporary comfort with period charm. Breakfast is served in the sunny dining room and features a wide ranging choice, using locally sourced produce wherever possible; special dietary requirements can be met by prior arrangement. The elegant guest sitting room offers books and games, and is decorated with some of the fine original art works which can be found througout the house. Moyness House is set in ample grounds, with outdoor seating for guests in a pretty walled garden to the rear. There is free parking for all guest vehicles within the grounds. There are no rooms available at Moyness House for these dates. The location is great for walking downtown, and the rooms were nice and quiet and clean. Staff was great and on site parking was a definite plus! We had dinner at Prime and Mustard Seed downtown and both were really good food. You can definitely walk to all restaurants and shops from the B&B even if it’s a bit rainy out. Very clean and elegant rooms; super breakfast, excellent dining recommendation and convenient location. My second visit, albeit now under new management, and is my first choice in Inverness. We stay at Moyness whenever we are in Inverness.We are greeted warmly and we enjoy the lovely sitting room - very comfortable! The location can't be beat as it is an easy walk into Inverness old town or along the River Ness. Morning walks along the river are a great way to start the day. We were made extremely welcome and even got an early check in Very good breakfast cooked to order and we loved the fresh fruit salad. Great location for city centre and extremely close to Eden Court Theatre a few minutes walk. Lovely place and so glad to gave found Moyness House. Great location not far from centre of town with ample parking. Our host John was very friendly and helpful. Our room was spotless and lots of nice touches like bathrobes. Breakfast was flawless too. 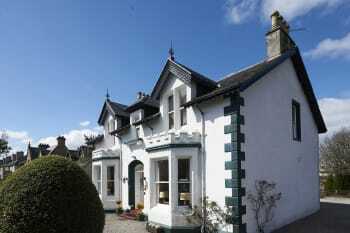 Highly recommend Moyness House and will not hesitate to book there the next time we are heading to Inverness. Clean and tidy with lovely private sitting room. Great location close to city centre and restaurants. John is an excellent host everything was great. Excellent staff fantastic room. This is an excellent B&B/hotel would stay again without hesitation. Try the Rocpool in Ness Street the atmosphere, service and food are excellent. Very friendly and helpful host :-) We received very good information and advices for restaurants and pubs in Inverness and for day trips around Inverness. The breakfast and service were excellent. We would give your breakfast a 5++ for the food and also for the efficient friendly service. Liked the ample onsite car parking. We think you guys have got it just spot on for what you offer, friendly service, quality breakfast food and are very reasonably priced for what you provide. 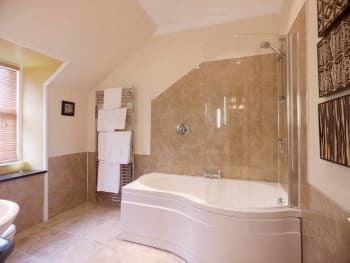 We also loved the Neil Gunn bathroom We left with only positive comments, no negative and without a doubt we most certainly will be back. We enjoy La Taverna Restaurant in Aviemore. The waiting service is excellent, it is quick but certainly not rushed. and the steaks are fabulous. It suits all pockets for lunch and evening dining from the value for money buffet to the a la carte menu. 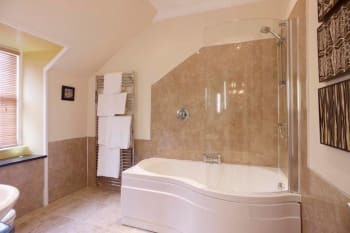 We had a very enjoyable stay - the room was gorgeous, roomy and with a lovely updated bathroom, which we really appreciated. We appreciated the generous and delicious breakfast and your recommendation for dinner was spot on. A lovely welcome from John who supplied local knowledge and assistance. The guesthouse is close to town and the breakfast was lovely. Toilet didn't flush all the time. 5 star service, great location, very comfortable. Also John is a great host. Excellent experience from start to finish. John is a wonderful host. Very friendly but not overpowering. Nice period room with a modern mod con bathroom. Next time I'll try to get a bigger room , just a bit easier to move around, especially when you're bringing too much luggage! John sent us to very good restaurants - notable Encore, mustard Seed and Harbour (pub) on the banks of the river Ness. It was a bit of a walk to the bus station but only about 15 minutes. Took a city bus to Culloden and a tour bus to Loch Ness boat trip and to Urquart Castle. Inverness is a great small city with lots of friendly residents. John is an amazing ambassador for Inverness. Thanks for everything John. This was a wonderful place. The owners were extremely nice and helpful. Breakfast was great and included a full meal as opposed to a continental or a quick bite. The walk to City Centre was quick and easy. 5 minutes walk from town centre and location good for golf course and tourist activities on lochness. Plenty shops bars and restraints 5 minutes walk. Beautiful scenery too. Very friendly and clean! Enjoyed sitting in the garden and it was a short walk to town. We really appreciated the recommended dinner option just down the street. Would recommend to all travelers! Lovely accommodation & great people to deal with. Very clean, pretty room. Huge bathroom. Good breakfast. Off-street parking. Good value. Friendly staff. There was a mix up because of the booking company and John went out of his way to sort it out and make us feel welcome. We really loved our stay and felt very fortunate to have discovered this perfect guest house. John was very helpful and even set us up with a reservation for dinner the first night. It was wonderful, all of it! Very friendly owner and help staff. Great breakfasts. Easy walk into main part of town. John was as gracious a host as he could be. The house is a wonderful Victorian with a large salon and dining room. 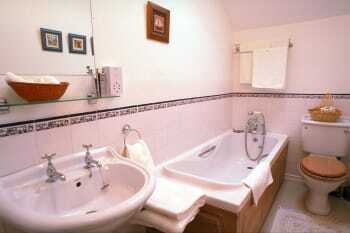 Our en suite bath was very nice and the room all we could need. We are from the country so the traffic on the street was noisy to us but a white noise machine took care of that. John recommended the restaurant Encore that was a fun place with a pub like atmosphere and very good food. We found Riva, a very nice Italian place, just around the corner from Encore so an easy 10 minute walk from Moyness. Riva has large windows that face the river and give a full view of the castle which turns a lovely color as the sun sets. The food here was wonderful. Culloden has a well done museum and interaction films and docents, the battlefield itself is so moving. Very Clean, friendly hosts, great breakfast, easy walk to downtown. Easy location to find for drivers, good parking, easy to get on road to Loch Ness. Eat at the Mustard Seed on north side of river in downtwon, but make reservations. Ideal location for exploring the city. A Fine B&B ! This is one of the best places we've ever stayed, wouldn't stay anywhere else in the Highlands. Take the train to the Isle of Skye and take the "Skye Jeep Tours". Very friendly and welcoming.We feel very looked after. Eden Court is excellent for music, drama, films. Great atmosphere and always "buzzing". For eating, there are so many. We've enjoyed Cafe Uno and The Kitchen Brasserie very much, both have very good food and atmosphere and service. Charming home near the heart of Inverness. John is a warm and generous host - as well as a great breakfast cook. He was full of recommendations to enhance our stay. We felt perfectly at home. Thanks John! As John would recommend, try Encore Une Fois, which is easy walking distance and has a relaxed menu of local specialties. Another great choice, right next door, is Rocpool. It's more crowded and therefore less cosy, but has great food. And when in Inverness don't miss the opportunity to visit Culloden battlefield. It is so well done. The Riverside Restaurant is a good find; small and cosy, friendly staff, excellent food. Absolutely Fantastic B&B. John & Wilma are lovely friendly hosts. Will be back to stay. Very nice & authentic b & b where one can really feel comfortable. The best breakfast served! John is really great. He makes sure you're comfortable, have had enough to eat, and know how to get to different parts of Inverness. He really goes out of his way to make sure your stay is amazing. lovely room, very comfortable bed, great breakfast and most importantly very friendly staff, definitely recommend! A recommendable guest house! It was in our view (a male couple on a round-trip through Scotland) one of the best accommodation on our tour. The owners were really kind, her service is excellent, the rooms are tastefully decorated and comfortable, everything is of high quality and the breakfast was superb. Spotlessly clean as well. There was only one point that could be better: the missing spray shield (shower in the bathtub). That was a bit uncomfortable. Tip for eating out: A good Italian restaurant at the river (5 min. walk). Busy but good quality (Riva Restaurant). What a lovely hotel, my only regret is that we had only one night there. The decor is tasteful and beautiful, everything was immaculate, and our host, John, was delightful. Couldn't have been happier with the place. The location of Moyness House is perfect. Far enough from the center of town to be quiet, but near enough that a pleasant walk gets you to great shops and restaurants. Very friendly, welcoming and helpful. Great location with easy walks to Town Centre and along the Ness. Excellent stay! 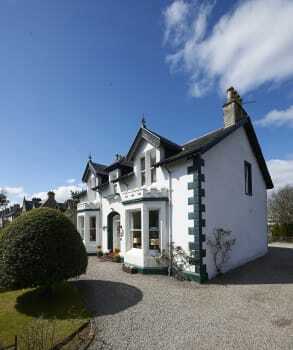 This is a lovely B & B with delightful owners, a great location and excellent value for money, while still being very close to downtown Inverness. as the recommended restaurants were either booked or closed on a Sunday evening, we finally ended up in a pub called "Johnny Foxes" in the basement of a shopping mall in the center: a nice place with good food at reasonable prices. Levely and quiet B&B, excellent Breakfast! Short walking distance to the Centre. Very friendly owner who makes the breakfast and has an interesting past with the RNLI. Cafe 1 was a very nice restaurant. Moyness House is a first rate B&B. John, the proprietor, is friendly and helpful and made us feel very welcome. The room was spotlessly clean and well-equiped. Internet access was also excellent. Breakfast was amongst the best we've had at a B&B - fresh, plentiful and very well-presented. Moyness House is close to a very good range of restaurants and cafes. There is also a large shopping mall relatively close to the establishment. Didn't have a chance to sightsee but John was very helpful in suggesting restaurants. If you are staying for a while suggest restaurants are booked in advance by internet as they can be very busy. Wow!This really is a fantastic guest house which would put most hotels in the shade. I can see why it has achieved such awards and accolades. John and his staff are friendly and go the extra mile, his breakfast is legendary all quality produce and very well presented. He even offered another guest a dram of whisky with their Porridge. 600 metres from Moyness and you are right in the centre of Aberdeen where there are a selection of very good Gastro eating establishments and choice. Very clean and recently decorated house,warm welcome and superb breakfast.Only a ten minute walk into town. Nice shopping centre at Inverness and owner advised us of places to eat in the town and also pointed out places of interest during our two week tour of Scotland. Try the Encore Une Fois restaurant for a meal with great atmosphere. Lovely guesthouse and excellent service. Good value. Very comfortable place to stay. The hosts were very helpful. Excellent Host. Friendly & inviting. Our room was very comfortable and we slept soundly. John was an excellent host with advice on places to go and to eat, the local information was very valuable. The Bakery for a lunch-time sandwich is round the corner while the Eden Court Theatre, Restaurant and Cinema complex is very close by. Hosts were great with local advice and suggestions. Excellent breakfast. It was lovely. Warm welcome by the owner, good location and an easy stroll to the river and town centre. The bedroom and ensuite were well equipped with everything we needed. The breakfast was amazing, I went for the traditional Scottish breakfast which was cooked to perfection with quality ingredients - the breakfast would put 5 star hotels to shame - the best I have had anywhere. The owner went out of his way to ensure that everything was just right. A truly memorable stay. Found a pleasant pub; the Castle Tavern, right next to the castle at the south side. Good pub food at reasonable prices and good selection of ales. It's really busy between 6&7 but the wait times aren't bad and the staff are very friendly. The perfect hosts! Our room 'Neil Gunn' was comfortable, clean and blessed with generous space. The breakfast was fab and set us up for the day! We will visit again. The Mustard Seed restaurant was special; the complimentary glass of wine was welcome - if John books it through Moyness House. Warm welcome and first class service - I would recommend without any hesitation to anyone looking for accommodation in Inverness. While we were only able to stay one night, we absolutely loved it at the Moyness House! We were walking distance to the main center of town and enjoyed the house itself as well as our hosts, who were lovely. Thanks for everything! We had dinner at the Waterfront (our hosts offered to book for us as soon as we arrived) and it was delicious! Then we went to Hootenanny's for some live Scottish music, which was crowded, but so fun. We'd recommend both! A lovely room and great breakfast in a convenient location. If you can get a reservation, eat at Rocpool Restaurant! Rooms were beautiful! Good was good. Felt very much like home. Lovely friendly staff. Clean and well stocked room. Scallops at the River House restaurant were the best I've ever eaten! The perfect location for a visit to Inverness and the surronding Highlands. Beautifully decorated and maintained guesthouse with a lovely garden within a 10 minute walk to center Inverness, but on a quiet street. GREAT breakfasts!!! Wonderful helpful hosts John and Wilma. Highly recommended. Lots of options from this great Inverness home base. We loved the Culloden battle field, thought Forres was a great place for lunch, a stroll and a distillery visit. In Inverness we enjoyed our dinner at friendly Waterfront pub and had a great "early bird" at lovely Cafe 1. Inverness, with it's river and walkable bridges is a great city! Very clean and welcoming. Well situated just a short walk to the town centre. Excellent breakfast and service. The Mustard Seed restaurant is well worth a vist but advisable to book in advance. The breakfast was the best we had during our two weeks in Scotland. The food was fresh and well-prepared. While the b&b is centrally located, about a fifteen minute walk from the train station, our room was quiet, and our sleep was never disturbed. The bed was comfortable, and both the bedroom and bathroom were scrupulously clean. The Moyness House deserves very high marks. We were travelling with our two sons around Scotland and had a lovely two days in June and I can't recommend Moyness House enough. John and Wilma & their helper Christine were very warm and made us feel extremely comfortable. The breakfast was extremely generous and fantastic! Thank you for a lovely stay in Inverness! Your hospitality will not be forgotten. We enjoyed travelling to Dunrobin castle and were very fortunate to experience the Falconry show. Not to be missed! This was Wilma and John's tip. We didn't care for Cromarty and wish we gone to Dunroch (not sure of the spelling). The Jacobite Lochness cruise was relaxing. Nette Kleinstadt. Als Ausgangspunkt für Tagestouren geeignet. She is a lovely host and really made us feel welcome. The owners, Wilma and John, are wonderful people and made us feel right at home. They had many suggestions on restaurants and things to do. We enjoyed our 3 days in Inverness. Nothing but high praise for the owners. We were greeted with a warm friendly smile by John and that continued throughout our stay. Nothing was too much trouble. Sorry we could not have stayed longer. One of the best B&B we have stayed at. John and Wilma were great hosts--from the minute we booked! Nice toiletries and bath robes in room. Rooms are nicely decorated. Good breakfast and on-site parking included. Provided sandwiches for us when we had to leave at 6:30 a.m.! Thank you for a lovely stay! Stayed here on several occasions,husband and I have loved it every time rooms are lovely&comfy with un suite bathroom&tea&coffee facilities,not far away from town center so it's a really nice walk too,would stay here again. Wonderful place to stay, Wilma & John are both very welcoming and friendly. Our room was beautifully decorated & spotless, the bed was extremely comfortable,the bathroom had pleny of quality towels, water was scalding hot & bath lovely & deep enabeling a long hot soak after an 9 hour train journey. Breakfast was magic! our poached eggs were fresh from Johns hens in the garden, all other ingreedients used were of the best quality, this has got to be the best Scottish breakfast we have ever had! We had a very relaxing break at Moyness House and we will be returning before the year is out. Thanks Wilma & John for looking after us so well during our stay. first class facilities. friendly and welcoming host. great breakfast. will be staying again. Very caring, friendly and attentive. They went out of their way to make our stay so enjoyable. It was our second visit and John and Wilma go the extra mile. It's a short and easy walk into Inverness and very handy for Eden Court. There are many good restaurants. The ones we like are, The Joy of Taste, The Kitchen Brasserie and Cafe Uno. Thank you for all! It is a beautiful house with excellent service. Our room, the Morning tide, was much more than expected and breakfast was huge and delicious. Always welcoming, great breakfast, lovely rooms. A great place to stay especially if you are wanting to go into Inverness a lot! Eden court cinema [10 minutes walk] is a good venue and the seats are better than the large Vue cinema out of town! The new owners of Moyness House have maintained the very high standards of the previous ones - the owner even drove me to the station when the taxi did not appear. It was a very comfortable stay. I would recommend The Mustard Seed for an evening meal and Judith Glue for souvenirs. The owners, John and Wilma, they are perfect hosts. Moyness is located very close to the town centre and river, perfect for touring Inverness city by foot and ideally located for exploring the Highlands to the north. Lovely rooms, good breakfast. easy off road parking and close to town so easy to walk to places to eat in the evening. As always a great place to stop. Close to the town centre and private parking meant it was easy to park up, relax then walk back into town for some food. 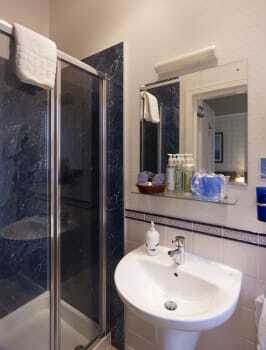 Immaculate room and shower room. Highly recommended. Jimmy Chung's Chinese is close and there are several restaurants including one that serves Gluten free food within walking distance. We felt very looked after by you. You were very attentive, helpful and caring. Had a lovely lunch at "Little Italy" cafe/restaurant and a great evening meal at "Cafe 1". Would recommend both very highly. Waterfront bar had excellent food. Outstanding accommodation, breakfasts, friendly/helpful owners and atmosphere!!!! Would stay again should we travel again to Inverness and happy to recommend to others. A flyer of current local activities in area would be useful. Wonderful recommendations and reservations made for us by the hostess at resturants in local area. Don't miss Hootnanny and have a Sassy Hot Choclate at So-Cocoas. A wonderful location to stay. Gorgeous room and excellent breakfast!! We stayed at Moyness House for 3 nights in August 2014. Richard and Jenny were welcoming and helpful,both while we were planning our visit and during our stay. The rooms were lovely and food was very good. We enjoyed that it was in a quiet area but close enough to walk to restaurants and the centre of town. We would absolutely recommend it to our friends (and have) and look forward to staying at Moyness House on our next visit. Perfect location - walking distance from the centre of town. Beautiful rooms, living and dining area, as well as excellent breakfast! Jenny and Richard were always happy to answer our questions and recommended local restaurants to eat at in the evenings. Would highly recommend to others - I look forward to returning here myself! We had dinner at The Kitchen and Rocpool during our stay - both offer early evening menus which were great value for money. Everything was first class - from being met by Jenny when we arrived who kindly gave us directions to the Eden Theatre (a short cut!) to our wonderful breakfast. I have never slept in a bed as comfortable as the one in the Neil Gunn room. I would definitely return. kind friendly and very efficient ... a great nights sleep and very central to restaurants and the center of Inverness being able to walk to dinner was a definite plus..
After being a touch sceptical about it, a visit to the Loch Ness centre was good value for money as was a trip to the Culloden battlefield. Similiar to other Highland areas the bars and restaurants want your money but don't want to try too hard to get it!!! Struggled with my door key - although help was at hand! Friendly house. Excellent breakfast. Wonderfull rooms. Had a great stay! Perfect place to discover Inverness Town by foot. If you want to see the Highland Games you are right down the street from the stadium. Lovely home and wonderful breakfast. We very much enjoyed our stay here. Great location,lovely facilities, excellent breakfast. The guest house is lovely and welcoming. The owners were gracious. We truly enjoyed our stay! Very kind and helpfull host. If we come back to Inverness, we will stay definitely at Moyness House. We can recommend the pub "Castle Taverne" and the music pub "Hootananny". And if you need something for your sport (cycling, hiking, etc.) take a look at "Alpine Bikes Inverness", here can also rent bikes. Our room was great. So modern and clean. Breakfast was delicious, plenty of choices. Very friendly and quiet B+B. Very comfortable room and bed and it was nice to have a separate sitting room available. Culloden was a really good day out and easily accessible by public bus. Loch Ness also worth a visit. A very nice couple who made us very welcome, you don't get a bed and breakfast that is any better. There is such a choice of excellent restaurants in Inverness, we took advice from the owners who will also reserve a table which is necessary, and were delighted with where we dined. We really enjoyed our stay - thank you! Of the six B&Bs we stayed with in Scotland this was by far superior. The bed was the best. The food lovely. The helpful attitude and care was wonderful. When we arrived at her door tired, frustrated, and generally stressed, Jenny knit us back together with her lovely smile and great attitude. We tried The Kitchen and Rocpool for dinner. Both quite nice. By all means visit Clava Cairns. Richard recommended it and he was so right. It was amazing. Super stay at Moyness House - lovely room, delicious breakfast, warm hospitality and very helpful hosts who offered lots of advice and suggestions for my trip. Looking forward to a return visit. 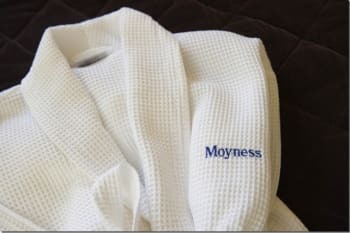 Very happy with our stay at Moyness and wouldn't hesitate to return or to recommend to others.